One of my favorite things about living in San Diego is the availability of really delicious authentic Mexican food. There is a taco stand on almost every street corner, no seriously, not an exaggeration. On any given block there will be an Alberto’s, Roberto’s, Rigaberato’s… The girls (that I nanny for) helped introduce me to my favorite place Taco Surf, or as the girls like to call it, Surf Taco. I could eat there 3 or 4 times a week. I love the carnitas and the carne asada is amazing. Occasionally I indulge in the rolled tacos, YUM. 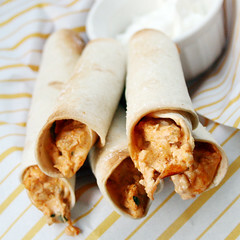 Rolled tacos are one of the most popular taco stand foods. Deep fried little rolls of heaven. All my life I’ve seen them called taquitos and I had only tasted the frozen variety, which are nothing to write home about. But rolled tacos from a taco stand, those are something I can get down with. Of course if I really ate these taco stand delights as often as I would like I’d have to go around in elastic waist pants all the time. Needless to say, when I saw this recipe I was instantly intrigued. They are a healthier homemade version. 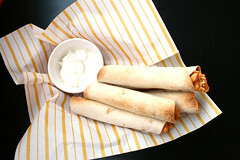 I love the fact that these taquitos, or rolled tacos, are not deep fried but still have a nice crispy salty finish. These are not a dead match for taco shop rolled tacos, but I think I actually like them better, let’s face it, it’s nice to know what’s inside and not have to worry about mystery meat. They come together quickly, can be frozen and baked later, and taste wonderful! Try them today! In a large bowl, combine the cream cheese with the salsa, lime juice, cumin, chile powder, cayenne, onion powder, garlic, cilantro, green onions, and 1/4 tsp kosher salt. 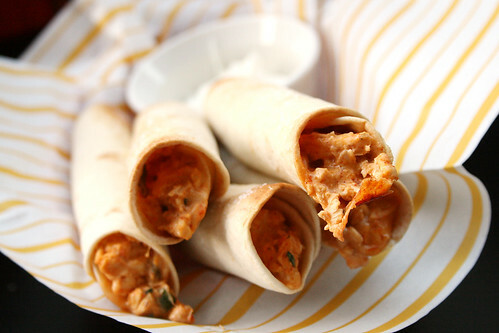 Fold in the chicken and cheeses. Taste and season with additional salt and pepper if necessary.